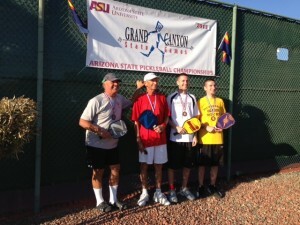 My brother Zack and I just returned from playing in the Grand Canyon State Games in Sun City Arizona. Wow, what an awesome experience! We left on Wednesday afternoon from Indianapolis and flew directly to Phoenix. When we got off the plane we couldn’t believe that this was Arizona. It was raining and a cold 44 degrees! We didn’t leave Indiana for this! We drove over to Happy Trails where, thanks to midwest pickleball legend Don Walker, we would be staying for the rest of the week and got settled in. Thursday was Age Group doubles. Zack and I played in the 19+ age division. Our first match was against the eventual champions, Aspen Kern and Chris Miller. It was a fun match to play but lets just say we were no match for them. After the first match we settled down and ended up getting the bronze medal. Not bad for two guys from Indiana who haven’t played outdoors in a few months! That night we celebrated by hanging out with one of our old roommates from college, Justin Masterson, who now pitches for the Cleveland Indians. He is down in Arizona for spring training with the team. It was great to catch up and hear some stories about being a major league baseball player. Wishing him a great year with the Tribe. Friday morning was the start of Mixed Doubles age groups. Zack and I didn’t bring our partners (our wives) on this trip so we hung out at the Pickleball Rocks booth all day and watched some great pickleball. After almost five hours of playing mixed doubles, a group of players invited Zack and I to play over at Happy Trails later that night. When we showed up we couldn’t believe all the players that showed up to play. It felt like the All Star game of pickleball. There were too many great players to name but National Champions Steve Wong, Mark Friedenberg, and Enrique Ruiz were just a few of the players we got to play with and against. After a great night of hanging out with the worlds best pickleball players, we had to get ready for the Men’s skill level tournament. Zack and I were playing in the 4.5 skill level tournament. We started off a little shaky, winning a close one 11-8, 11-8. That would turn out to be the closest match we would have all day. From there it was one of those magical days. We finally started to pull everything together. We went on to take the gold medal without dropping a game. I think it is the best that Zack and I have ever played together. The only thing that would have made it better was having our family out there to watch us. Thanks Dad for sending us out for this one. After receiving our medals and taking some pictures, we were off to celebrate. So how do you celebrate in Arizona after being at a pickleball tourney for seven hours? Right! You go play more pickleball! We grabbed a quick bite to eat with our good friend Stephanie Lane and headed back over to Happy Trails to play even more! Our good friend and noted pickleball coach, Prem Carnot said that when you are in Pickleball Heaven you might as well play pickleball! 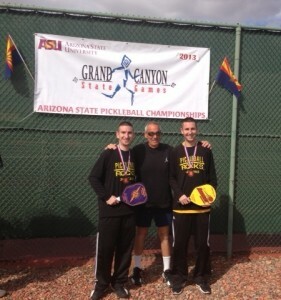 Arizona is truly pickleball heaven. We met a lot of great people and got to play a ton of pickleball. Hopefully this tournament becomes a yearly trip for us. Maybe next time we will take the Rocket with us! Thanks again Dad! Pickleball Rocks! As we all know, Pickleball Rocks. But some people may not know how much pickleball means to us personally. The Grubbs family has always been a sports family. For years, tennis was our sport. My wife Karen and I both played tennis recreationally while our two boys were small. Later I played USTA tournaments, rising as high as a 4.5 rating before retiring to watch sons Josh and Zack play in college. For the next 5 years, Karen and I rarely missed a college match. Tennis gave us a reason to be together on a regular basis. And we enjoyed every minute of those times. When the boys college tennis careers ended, pickleball suddenly came into our lives through an introduction by some good friends. We immediately knew we had found our new family sport. Soon we joined the USAPA and began playing and spreading the good word of pickleball through a simple website called AllAboutPickleball.com. Tournaments became, and continue today to be, a full family road trip with many times Karen and me and both sons and their wives playing with 2 grandsons in tow. Pickleball gives us our reason to get together on a regular basis, so the good times are still in full force and we love every minute of it. From our meager beginning, All About Pickleball has grown into a full family affair with several businesses now, including PickleballRocks.com, our national pickleball blogging news website, PickleballVideoNetwork.com where we bring you the very best in high interest, fun and educational pickleball videos, and our latest, PickleballShopping.com with the very best selection of cool “Pickleball Rocks” logo dri-fit shirts for ladies and gents, hats, coolers, cooling towels, and other assorted pickleball gifts. Yes, pickleball has been very good to us and we are truly thankful for pickleball and everyone who promotes it. Recently our family had our yearly planning and goal setting meeting to discuss what our plans are for pickleball this year. Someone, and I don’t remember who, came up with the idea of somehow giving back because pickleball has been so very good to our family. So the decision has been made that for this year, from every sale we make from any of our pickleball related businesses, we will donate one dollar of that sale to the USAPA to help grow the sport of pickleball. 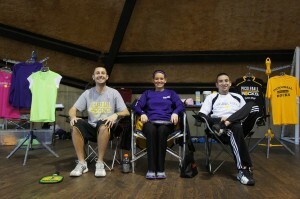 We wish we could do more because the sport has certainly been a blessing to the Grubbs family. But for this year, the one dollar donation will be our policy. We want to thank everyone in advance who makes any purchase, big or small, from us. 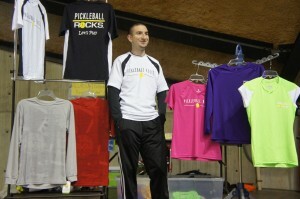 That includes pickleball paddles, our very popular “Pickleball Rocks” dri fit shirts, portable chairs, cooling towels, etc. 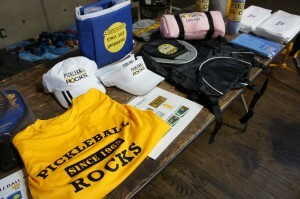 Yes, anything you buy from us will put a dollar in the pot to help grow pickleball. In doing so, you too will be giving back to our great sport. We hope you have a blessed 2013 filled with love, good health and lots of pickleball.